Dachry, W., Aghezzaf, B., Bensassi, B. (2013). Collaborative Information System for Managing the Supply Chain: Architecture Based on a Multi Agent System. International Journal of Research in Industrial Engineering, 2(2), 1-16. W. Dachry; B. Aghezzaf; B. Bensassi. "Collaborative Information System for Managing the Supply Chain: Architecture Based on a Multi Agent System". 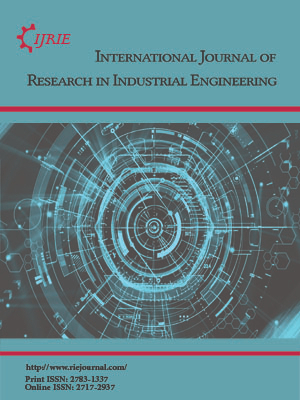 International Journal of Research in Industrial Engineering, 2, 2, 2013, 1-16. Dachry, W., Aghezzaf, B., Bensassi, B. (2013). 'Collaborative Information System for Managing the Supply Chain: Architecture Based on a Multi Agent System', International Journal of Research in Industrial Engineering, 2(2), pp. 1-16. Dachry, W., Aghezzaf, B., Bensassi, B. Collaborative Information System for Managing the Supply Chain: Architecture Based on a Multi Agent System. International Journal of Research in Industrial Engineering, 2013; 2(2): 1-16. 1Department of Mathematics and Computer Faculty of sciences, Hassan II University, Casablanca, Morocco. 2Department of physics, Faculty of sciences, Hassan II University, Casablanca, Morocco. Faced with new constraints of their environment, industries are forced to join together in collective entities and collaborate with their partners. These companies have realized the importance of collaboration between companies and have begun to adopt new patterns of behavior to improve their productivity, profitability and flexibility during market requests. Indeed, the collaboration between firms has become a major strategic choice. Companies have begun to think of how to cooperate, a new form of management must be developed to ensure coordination and information’s sharing, in real time, between different stakeholders in the supply chain; suppliers, customers, subcontractors and carriers, etc. Faced with these issues, we truly believe that it is important to build a new information system; this one have to be modern, efficient and flexible in order to optimize and control the flow of information between supply chain actors. The approach presented in this paper is considered among the works that aim to propose solutions related to information systems based on multi-agent systems, in order to ensure coordination between services of various partners, sharing and traceability of information.